Although stem cell-based treatments for stroke and other neurodegenerative diseases have advanced rapidly, there are still few clinical treatments available. In this study, rats receiving intracerebral peripheral blood hematopoietic stem cell (CD34+) (PBSC) transplantation showed much more improvement in neurological function after chronic cerebral ischemia in comparison with vehicle-treated control rats. Using laser-scanning confocal microscopy, implanted PBSCs were seen to differentiate into glial cells [GFAP+ (glial fibrillary acidic protein-positive)], neurons [Nestin+, MAP-2+ (microtubule-associated protein 2-positive), Neu-N+ (neuronal nuclear antigen-positive)], and vascular endothelial cells [vWF+ (von Willebrand factor-positive)], thereby enhancing neuroplastic effects in the ischemic brain. Cortical neuronal activity, as evaluated by 1H-MRS (proton magnetic resonance spectroscopy), also increased considerably in PBSC-treated rats compared with a vehicle-treated control group. In addition, PBSC implantation promoted the formation of new vessels, thereby increasing the local cortical blood flow in the ischemic hemisphere. These observations may be explained by the involvement of stem cell-derived macrophage/microglial cells, and β1 integrin expression, which might enhance this angiogenic architecture over the ischemic brain. Furthermore, quantitative reverse transcription-PCR analysis showed significantly increased modulation of neurotrophic factor expression in the ischemic hemisphere of the PBSC-transplanted rats compared with vehicle-treated control rats. Thus, intracerebral PBSC transplantation might have potential as a therapeutic strategy for treating cerebrovascular diseases. Because neuronal death is the major pathogenetic mechanism in neurodegenerative diseases such as cerebrovascular disease, stem cell therapy has been proposed as an effective “regenerative” approach (Lindvall et al., 2004; Taguchi et al., 2004). However, the transplantation of embryonic grafts, as used in previous clinical trials (Boer, 1994; Barinaga, 2000), is hampered by logistical and ethical considerations, and so it is important to find alternative sources of stem cells. Stem cells can be isolated from various tissues (Prockop, 1997; Erices et al., 2000). For example, adult bone marrow contains mesenchymal stem cells (MSCs) or stromal cells, which can potentially differentiate into a variety of cell types such as adipocytes, chondrocytes, and myoblasts (Prockop, 1997; Dennis and Charbord, 2002). Human umbilical cord blood (hUCB) (Prockop, 1997; Erices et al., 2000) has also been shown to contain large numbers of hematopoietic colony-forming cells (Nakahata and Ogawa, 1982). The mononuclear cells derived from hUCB cells, can be induced to express class III β-tubulin, glial fibrillary acidic protein (GFAP), GalC (an oligodendrocyte marker) (Galvin-Parton, 2003), and microtubule-associated protein 2 (MAP-2) (Ha et al., 2001). However, the complicated culturing conditions for in vitro expansion of MSCs, together with the required HLA (human histocompatibility leukocyte antigen) matching for hUCB transplantation between donor and recipient, may limit the clinical application of these cells. Therefore, the use of autologous stem cells without in vitro expansion may be an appropriate strategy for clinical applications. Peripheral blood hematopoietic stem cells (PBSCs) have been increasingly used as a source of hematopoietic stem cells for transplantation. In comparison with bone marrow transplants, intracerebral transplants with PBSCs have been shown to lead to faster hematological recovery with less supportive care requirement (To et al., 1992), although the concentration of PBSCs under steady-state conditions with no cytokine induction is very low (Elfenbein and Sackstein, 2004). In a recent report, granulocyte colony-stimulating factor (G-CSF) was shown to mobilize hematopoietic stem cells (HSCs) into the peripheral blood from bone marrow (Demetri and Griffin, 1991), thus amplifying the concentration of PBSCs. Furthermore, PBSCs have already been used in transplantation for the regeneration of nonhematopoietic tissues, such as skeletal muscle, heart (Orlic et al., 2001), and neurons (Sigurjonsson et al., 2005). In this study, we investigate the administration of intracerebral PBSC transplantation as a therapeutic strategy to determine its effect on chronic stroke in rats. In addition, we examine whether these strategies could be of practical use in clinical medicine. Adult male Sprague Dawley rats (weighing 250–300 g) were used in this study. Experimental animals were subjected to three-vessel ligation. All surgical procedures were performed using sterile/aseptic techniques in accordance with university institutional guidelines. The rats were anesthetized with chloral hydrate (0.4 g/kg, i.p.). Ligation of the right middle cerebral artery (MCA) and bilateral common carotids [common carotid arteries (CCAs)] were performed by modified methods described previously (Chen et al., 1986). Bilateral CCAs were clamped with nontraumatic arterial clips. Using a surgical microscope, a 2 × 2 mm craniotomy was drilled where the zygoma fuses to the squamosal bone. The right MCA was ligated with a 10-0 nylon suture. Cortical blood flow was measured continuously with a laser Doppler flowmeter (LDF) (PF-5010; Periflux system; Perimed, Stockholm, Sweden) in anesthetized animals. A burr hole (l mm diameter) was made in the right frontoparietal region to allow placement of photodetectors. A probe (0.45 mm in diameter) was stereotaxically placed in the cortex (1.3 mm posterior, 2.8 mm lateral to the bregma, and 1.0 mm below the dura). After 90 min of ligation, the suture on the MCA and arterial clips on CCAs were removed to allow reperfusion. Core body temperature was monitored with a thermistor probe and maintained at 37°C with a heating pad during anesthesia. After recovery from anesthesia, body temperature was maintained at 37°C with a heat lamp. Purification and selection of CD34+ PBSCs. To purify the PBSCs, rats were injected with G-CSF (50 μg/kg) subcutaneously for 5 d. Immediately, peripheral blood was collected in sterile tubes containing citrate–dextrose solution as an anticoagulant. Mononuclear cells (MNCs) were isolated from peripheral blood using the Ficoll-Histopaque (Sigma, St. Louis, MO) centrifugation method (Asahara et al., 1997). The MNC layer was collected and washed twice with 1 mm EDTA in PBS. CD34+ MNCs were separated from 2 × 108 MNCs by a magnetic bead separation method [magnetic-activated cell sorting (MACS)] (Miltenyi Biotec, Gladbach, Germany) according to the manufacturer's instructions. In brief, MNCs were suspended in 300 μl of PBS and 5 mm EDTA. These cells were labeled with a hapten-conjugated monoclonal antibody against CD34 (PharMingen, San Diego, CA), followed by an anti-hapten antibody coupled with microbeads, and were incubated with beads at ratios of 100 μl of beads per 108 cells for 15 min at 4°C. The bead-positive cells (CD34+ MNCs) were enriched on positive-selection columns set in a magnetic field. FACS analysis using anti-CD34 antibodies (PharMingen) labeled with phycoerythrin (Becton Dickinson, Mountain View, CA) of MACS-sorted cells showed that 96 ± 3% of the selected cells were positive for CD34 (Fig. 1B). Then, cells labeled with 1 μg/ml bisbenzimide (Hoechst 33342; Sigma) were cultured in RPMI (Invitrogen, Grand Island, NY) plus 10% FBS (HyClone, Logan, UT) at 37°C in a humidified atmosphere of 5% CO2/95% air and antibiotics for 1 h, and prepared for transplantation. A, Schematic representation for the investigation of chronic cerebral ischemia with three therapeutic protocols. Cerebral ischemia was induced by three-vessel ligation (3-VL) in each experimental rat on day 0. In group 1 (vehicle control), rats received saline starting 7 d after cerebral ischemia was induced and were killed on day 28. In group 2 (PBSC transplantation), rats received intracerebral PBSC transplantation on day 7 and were killed on day 28. B, Representative FACS analysis of CD34+ PBSCs isolated from G-CSF-induced cell mobilization using magnetic immunobeads. More than 96% of the sorted cells expressed the CD34+ surface antigen. Thus, PBSC transplantation improves neurological behavior after cerebral ischemia. C, A body asymmetry trial was used to assess body swing before and after MCA ligation. Between 14 and 28 d after cerebral ischemia, rats intracerebrally treated with PBSCs exhibited significantly reduced body asymmetry in comparison with controls. D–F, Locomotor activity was examined for all experimental rats. Vertical activity, vertical movement time, and the number of vertical movements significantly increased between 14 and 28 d after cerebral ischemia in rats receiving PBSCs in comparison with vehicle control rats. Data are expressed as mean ± SEM. *p < 0.05 versus control. Experimental animals treated with PBSC transplantation and vehicle control. The treatment protocol for experimental rats was divided into two groups (Fig. 1A): PBSC transplantation and a control group. Cerebral ischemia was induced in every experimental rat on day 0. Experimental rats in the allograft PBSC transplantation group were injected stereotaxically with ∼2 × 105 cells of PBSCs (CD34+) labeled with bisbenzimide in a 3–5 μl PBS suspension through a 26-gauge Hamilton syringe into three cortical areas, 3.0–5.0 mm below the dura. The approximate coordinates for these sites were 1.0–2.0 mm anterior to the bregma and 3.5–4.0 mm lateral to the midline, 0.5–1.5 mm posterior to the bregma and 4.0–4.5 mm lateral to the midline, and 3.0–4.0 mm posterior to the bregma and 4.5–5.0 mm lateral to the midline. The needle was retained in place for 5 min after each injection, and a piece of bone wax was applied to the skull defects to prevent leakage of the injected solution. Experimental rats in the vehicle control group were treated with saline stereotaxically. Behavioral assessments were performed 3 d before cerebral ischemia, and 1, 7, 14, 21, and 28 d after treatment. The tests measured (1) body asymmetry, (2) locomotor activity, and (3) grip strength measurement. Pretreatment scores were recorded to normalize those taken after cerebral ischemia. (1) Body asymmetry: The elevated body swing test was used to assess body asymmetry after MCA ligation and evaluated quantitatively, as described previously (Borlongan et al., 1998). Initially, animals were examined for lateral movement, with their bodies suspended by their tails. The frequency of initial head swing contralateral to the ischemic side was counted in 20 continuous tests and normalized, as described previously (Chang et al., 2003). (2) Locomotor activity: Rats were subjected to VersaMax Animal Activity monitoring (Accuscan Instruments, Columbus, OH) for ∼2 h for behavioral recording of each of the experimental rats. The VersaMax Animal Activity monitor contained 16 horizontal and 8 vertical infrared sensors spaced 87 cm apart. The vertical sensors were situated 10 cm from the floor of the chamber. Locomotor activity was counted as the number of beams broken by a rat's movement in the chamber. Three vertical parameters defined in the manufacturer's menu option were calculated over 2 h at night: vertical activity, vertical time, and number of vertical movements. (3) Grip strength was analyzed using a Grip Strength Meter (TSE Systems, Bad Homburg, Germany) as described previously, with modification (Dunnett et al., 1998). In brief, the grip strength ratio of each forelimb was measured separately and was calculated as the ratio between the mean strength out of 20 pulls of the side contralateral to the ischemia and that of ipsilateral side. In addition, the ratio of grip strength after treatment and before treatment was also calculated, and changes were presented as a percentage of the pretreatment value. Overall, the investigators were blinded when measuring behavioral changes in the PBSC-treated and control group. To evaluate the infarcted area, experimental animals were imaged 3, 7, 14, and 28 d after treatments in each of the PBSC-treated and control groups. Magnetic resonance imaging (MRI) was obtained for the animals on a 3.0 Tesla whole-body Signa EchoSpeed MR scanner (General Electric, Milwaukee, WI). The animals were anesthetized with chloral hydrate (0.4 g/kg, i.p. ), supported on a wooden cradle, and their heads were placed in a home-made birdcage coil with a 5 cm outer diameter. After the acquisition of scout images, six to eight coronal plane images were taken from between 3 mm behind the olfactory bulb and the caudal portion of the cerebellum. Each slice was 2 mm thick without any gaps, with a matrix size of 320 × 160 and an 8 × 4 cm field of view. T2-weighted fast-spin echo sequences were optimized to detect the lesion size. The acquisition parameters were as follows: echo time (TE)/repetition time (TR), 105/4000 ms; echo train length, 53; number of excitations, 8. Each image was determined by a consensus of two observers blinded to the PBSC-treated and control group. Proton magnetic resonance spectroscopy assessment. To assess the therapeutic potential of each of the PBSC-treated and control rats, animals were imaged 3, 7, 14, and 28 d after the treatment. Proton magnetic resonance spectroscopy (1H-MRS) was performed using the same MRI scanner using a multivoxel technique. T2-weighted transverse, coronal, or sagittal images were used to localize the volume of interest (VOI). The VOI (0.5 × 0.5 × 0.5 cm3) was precisely localized centrally to the infarcted brain using two or three images (transverse and sagittal/coronal). The spectroscopic acquisition parameters were as follows: TR, 3.0 s; TE, 30 ms; and number of signal, 36 average with PROBE (proton brain exam) (GE Medical Systems, Fairfield, CT). CHESS (chemical shift selective) sequence was used for suppression of the H2O signal. All raw data were transferred to a Sun Sparc-10 workstation (SUN Computer, Sunnyvale, CA), and processed using SA/GE (spectral analysis/General Electric) software (GE Medical Systems) incorporating low-frequency filtering of residual water signals, apodization by 0.5 Hz of exponential line broadening, zero-filling of 8k, Fourier transformation, and Lorenzian-to-Gaussian transformation according to the scheme described previously (Kreis et al., 1992). Metabolic peaks were fitted by the Lorenzian line shape at known frequencies of N-acetylaspartate (NAA) at 2.02 ppm, creatine (Cr) at 3.03 ppm, and choline and choline-containing compounds (Cho) at 3.22 ppm. The values of the [NAA/Cr] and [NAA/Cho] ratios were calculated. The result of the metabolic ratio is presented as mean ± SE. Bromodeoxyuridine (BrdU), a thymidine analog that is incorporated into the DNA of dividing cells during S-phase, was used for mitotic labeling (Sigma). The labeling protocol has been described previously (Zhang et al., 2001). The BrdU immunostaining procedure with specific antibody against BrdU (1:400; Sigma) and quantification of BrdU-immunoreactive cells have been described previously (Zhang et al., 2001). Experimental rats were anesthetized with chloral hydrate (0.4 g/kg, i.p. ), and their brains were fixed by transcardial perfusion with saline, followed by perfusion and immersion in 4% paraformaldehyde, before being removed and embedded in 30% sucrose. A series of adjacent 20-μm-thick sections were cut from each brain in the coronal plane, stained with hematoxylin and eosin, and observed by light microscopy (E600; Nikon, Tokyo, Japan). For BrdU immunostaining, DNA was first denatured by incubating each section in 50% formamide of 2× standard saline citrate at 65°C for 2 h, and then in 2N HCl at 37°C for 30 min, and finally rinsed in 0.1 m boric acid with pH 8.5. Sections were then rinsed with Tris buffer and treated with 1% H2O2 to block endogenous peroxidase. The immunostaining procedure was performed using the labeled streptavidin–biotin (LSAB) method (LSAB-2 kit; peroxidase; DakoCytomation, Carpinteria, CA). Brain tissue, on a silane-coated slide, was placed in boiling citrate buffer, pH 6 (ChemMate; DakoCytomation), twice for 5 min in a microwave oven at 750 W, after deparaffinization and rehydration. Tissues were then incubated with the appropriate diluted primary antibodies to BrdU (for nuclear identification; dilution, 1:400; Sigma), at room temperature for 1 h. After washing with TBS-T (Tris-buffered saline containing 0.1% Tween 20), the specimens were sequentially incubated for 10–30 min with biotinylated anti-rabbit and anti-mouse (1:200; R&D Systems, Minneapolis, MN) Igs and peroxidase-labeled streptavidin. Staining was performed after a 10 min incubation with a freshly prepared substrate–chromogen solution, containing 3% 3-amino-9-ethylcarbazole and hydrogen peroxide. Finally, the slides were lightly counterstained with hematoxylin, washed with water, and mounted. Negative control sections were stained with identical preparations of brain tissue specimen, except that primary antibodies were omitted. Quantification of BrdU-immunoreactive cells was counted digitally using a 60× objective lens (LSM510; Carl Zeiss, Oberkochen, Germany) via a computer imaging analysis system (Imaging Research, St. Catharines, Ontario, Canada). Immunofluorescent colocalization analysis by laser-scanning confocal microscopy. To identify cell type-specific markers colocalized with exogenous transplanted PBSCs (bisbenzimide-labeled) and endogenous homing stem cells (BrdU immunoreactive), immunofluorescent colocalization analysis by laser-scanning confocal microscopy was performed. To identify cell type-specific markers colocalized with endogenous homing of stem cells (BrdU-labeled, FITC-conjugated; 1:400; Boehringer Mannheim, Mannheim, Germany) and exogenous transplanted mobilized peripheral blood hematopoietic stem cells (MPBSCs) (bisbenzimide-labeled; blue fluorescence), immunofluorescent colocalization analysis by laser-scanning confocal microscopy was performed. In immunofluorescent colocalization studies, each coronal section was treated with cell-specific antibodies (Table 1) as follows: GFAP (for astrocyte; 1:400; Sigma), von Willebrand factor (vWF) (for endothelial cell; 1:400; Sigma), neuronal nuclear antigen (Neu-N) (for neuronal nuclei; 1:200; Chemicon, Temecula, CA), Nestin (for neuronal dendrites) (1:200; Chemicon), and MAP-2 (for neuronal dendrites; 1:200; Boehringer Mannheim), with Cy3 (1:500; Jackson ImmunoResearch, West Grove, PA) staining. Evaluation of PBSC transplantation-induced angiogenesis and vascular remodeling by macrophage/microglial cells. Twenty-eight days after treatment with PBSCs in cerebral ischemic rats, cerebral microcirculation was analyzed by administering the fluorescent plasma marker (FITC-dextran; Sigma) intravenously to rats and observing them with fluorescent microscopy (Axiovert 200M; Carl Zeiss), as described previously (Morris et al., 1999). In addition, to quantify the cerebral blood vessel density and examine the vascular remodeling by macrophages, experimental rats were anesthetized with chloral hydrate and perfused with 4% paraformaldehyde. Histological sections (6 μm) were stained with specific antibody to CD-31 (1:100; PharMingen), OX-42 (1:400; Serotec, Indianapolis, IN), and ED-1 (1:500; Serotec), and conjugated with Cy3 (1:500; Jackson ImmunoResearch). The number of blood vessels present was determined as described previously (Taguchi et al., 2004). The total number of positive macrophage/microglial (MA/MI) cells per section was counted as described previously (Pipp et al., 2003). Western blotting of β1 integrin expression. To check the expression of β1 integrin, brain tissue samples (ischemic cortex and striatum) were determined by specific antibody against β1 integrin (1:300; Chemicon) using Western blotting analysis. Moreover, β1 integrin activation was blocked by the use of synthetic cyclic RGD peptide (1 μg/ml; Peptides International, Louisville, KY), which had been added to the PBSCs, and then injected into the ischemic brain. Finally, neurological behavioral measurement and blood vessel density (CD31 immunoreactivity) as described above was examined to evaluate the outcome of these three treatment protocols including PBSCs with synthetic cyclic RGD peptide and control. Measurement of reactive cerebral blood flow. Experimental rats were positioned in a stereotaxic frame and baseline local cortical blood flow (bCBF) was measured continuously with a LDF (LDF monitor; Moore Instruments, Devon, UK) in an anesthetized state (chloral hydrate) as described previously (Tuettenberg et al., 2001). The reactive cerebral blood flow (rCBF) was examined after intraperitoneal injection of 50 mg/kg acetazolamide (Diamox; Lederle, Pearl River, NY) and defined as percentage change of bCBF. Quantitative reverse transcription-PCR of growth factor synthesis in vivo. Experimental rats were anesthetized with chloral hydrate (0.4 g/kg, i.p.) 3, 7, 14, and 28 d after initiation of the three treatments. Ischemic cortical and striatal areas were evacuated on ice immediately. Subsequently, brain tissue samples were homogenized by a plastic hemogenizer, and total RNA was isolated using the RNeasy (Qiagen, Hilden, Germany). The relative amount of target mRNA was determined by quantitative reverse transcription-PCR (QRT-PCR) using SYBR Green following the manufacturer's instructions (Roche Diagnostics, Alameda, CA), and specific primers were used as summarized in Table 2. The relative expression levels of target mRNA were normalized against a control. Glyceraldehyde-3-phosphate dehydrogenase (GAPDH) was used as an internal standard. The whole procedure of QRT-PCR was the same using the ABI Prism 7900 Sequence Detection System (Applied Biosystems, Foster City, CA) as described previously with modification (Luo et al., 2004). The conventional RT-PCR was also performed as described previously (Shyu et al., 2004a). All measurements in this study were performed blindly. Results were expressed as mean ± SEM. The behavioral scores have been evaluated for normality. Student's t tests were used to evaluate mean differences between the control and the treated groups. To evaluate neurological function after cerebral ischemia, a body asymmetry trial was used to assess body swing before and after MCA ligation in PBSC transplantation rats (n = 10) and control rats (n = 10). The behavioral measurement scores were all normalized by the baseline scores. Because cerebral ischemia causes imbalanced motor activity, all of the experimental rats developed significant body asymmetry, turning contralateral to the side of the ischemic brain on day 1 after cerebral ischemia. PBSCs were separated from peripheral blood of rats after subcutaneous G-CSF injection. The CD34+ PBSCs were isolated by a magnetic bead separation method (MACS). The purity of isolated CD34+ PBSCs was found to be >96%, as established by fluorescence-activated cell sorter (FACS) analysis (Fig. 1B). From 14 to 28 d after treatment, rats treated with intracerebral PBSC transplantation, exhibited significantly reduced body asymmetry in comparison with control rats (p < 0.05) (Fig. 1C). Locomotor activity was examined before and after cerebral ischemia in all animals. Vertical activity, vertical movement time, and the number of vertical movements significantly increased between 14 and 28 d after cerebral ischemia in rats receiving PBSC transplantation in comparison with control populations (p < 0.05) (Fig. 1D–F). Furthermore, measurement of grip strength was performed to examine the forelimb strength for all experimental rats before treatment and 28 d after each of the two treatments. The final results revealed that a higher ratio of grip strength was found in the PBSC group (1.63 ± 0.37) in comparison with the control group (0.61 ± 0.35) (p < 0.05) (data not shown). Representative anatomical pictures (Fig. 2A,B) and fluorescent histologies of rat brains (Fig. 2C,D) are shown for PBSC-treated and control rats 28 d after cerebral ischemia. MRI was also used to examine the infarcted area of these two groups (Fig. 2E,F). To verify the local neuronal metabolism enhanced by the stem cell engraftment, 1H-MRS was used to assess the neuronal activity of the ischemic rats after each of the two treatments. In normal rats without ischemia, the cerebral cortex as viewed by 1H-MRS (without ischemia), displayed three important signals: Cho, Cr, and NAA (Lu et al., 1997). The 1H-MRS of the infracted brains (using a multivoxel technique) (Fig. 2G) showed a sharp decrease in NAA signaling, together with a mild decrease in Cho and Cr signals (Fig. 2H,I). Four weeks after the two treatments, significant improvements (p < 0.05) in neuronal activity were observed under 1H-MRS, specifically in regard to NAA/Cho and NAA/Cr (2.77 ± 0.13 and 2.95 ± 0.13, respectively) (n = 6) of the PBSC-treated group, and to NAA/Cho and NAA/Cr (1.69 ± 0.13 and 1.88 ± 0.17, respectively) (n = 6) of the control group. Intracerebral PBSC treatment increases neuronal activity, as demonstrated by 1H-MRS. A–D, Gross anatomical pictures of infarcted areas (shown by the black arrowhead) (A, B) and fluorescent histology of rat brains (C, D) are shown for the PBSC-treated rats, and vehicle control-treated rats 28 d after cerebral ischemia. E, F, MRI also indicates the infarcted areas (shown by the white arrow) of the PBSC-treated rats and the control-treated rats. G, 1H-MRS was used to assess the neuronal activity of infarcted brain areas using the multivoxel technique (*). H, I, Four weeks after cell transplantation or vehicle treatment, significant improvement in neuronal activity under 1H-MRS was observed in the PBSC-treated group compared with the control group. Data are expressed as mean ± SEM. *p < 0.05 versus control. To determine whether intracerebral PBSC transplantation could enhance central (brain parenchymal) and peripheral stem cells homed and engrafted into the brain after ischemia, BrdU labeling was used to follow the growth of these homing stem cells in the brain. BrdU-immunoreactive cells were detected mainly in the penumbra area, striatum, and subventricular area of the lateral ventricle in PBSC transplantation rats. Cumulative labeling of BrdU revealed a few BrdU-immunoreactive cells in the ipsilateral hemisphere near the penumbra area (Fig. 3A,B), the striatal region (Fig. 3C,D), and the subventricular region (Fig. 3E–H) in the PBSC-treated group. BrdU-immunoreactive cells were also found around the lumen of varying calibers of blood vessels (and also in the vessel walls of endothelial cells) (Fig. 3I–L) in the penumbric region, suggesting that mobilized stem cells may participate in angiogenesis. In BrdU pulse-labeling experiments, the number of BrdU-immunoreactive cells in the penumbric region of ischemic cortex and striatum significantly increased in the PBSC-treated rats (n = 8) compared with saline control rats (n = 8) (p < 0.05) (data not shown). Immunohistochemical staining for BrdU. In rats treated with PBSCs and vehicle control after cerebral ischemia, a few BrdU-immunoreactive cells were detected in the ipsilateral cortex close to the following areas: the infarct boundary (A, B; shown by the arrow), the striatum (C, D; shown by the arrow), and the subventricular area (E–H; shown by the arrow). BrdU-immunoreactive cells were also found around blood vessels in the penumbric region of the ipsilateral cortex (I–L; shown by the arrow). Data are expressed as mean ± SEM. *p < 0.05 versus control. Scale bars, 50 μm. To determine whether exogenous transplanted PBSCs and endogenous homing stem cells could differentiate into neurons, glial cells, or endothelial cells in ischemic brains of the experimental rats, immunofluorescent colocalization studies using a laser-scanning confocal microscope were performed. In a colocalized study of exogenous transplanted PBSCs, the results showed that some bisbenzimide-labeled cells (blue; cell nuclei fluoresce spontaneously) colocalized with antibodies for MAP-2, Nestin, Neu-N, and GFAP (red; neural cell type-specific markers) (Fig. 4A–L) in the penumbra of PBSC-treated ischemic rat brains. The percentages of bisbenzimide-labeled cells colocalizing with the specific markers MAP-2, Nestin, Neu-N, and GFAP were ≈3% (6000 cells), ≈3% (6000 cells), ≈2% (4000 cells), and ≈5% (10,000 cells), respectively. Furthermore, in the colocalized study of the endogenous (homing) stem cells, the results showed some BrdU+ cells (green for cell nucleus identification) colocalized with markers for MAP-2, GFAP (red for cell type-specific markers) (Fig. 4M–R). These findings indicate that PBSC transplantation might enhance central and peripheral stem cell homing and differentiation, thereby generating new neural tissue for the repair of injured areas of the brain after ischemic injury. Neuroplastic effects after intracerebral transplantation of PBSCs after cerebral ischemia. A–C, In the representative penumbric area (□), the results show many bisbenzimide-labeled cells (blue for cell nuclei) colocalized with the cellular marker MAP-2 (red for cytoplasm; shown by the white arrow). D–F, Several bisbenzimide-labeled cells also colocalized with the cellular marker Nestin (red for cytoplasm; shown by the white arrow). G–I, Some bisbenzimide-labeled cells also colocalized with the cellular marker Neu-N (red for nuclei; shown by the white arrow). J–L, Some bisbenzimide-labeled cells colocalized with the cellular marker GFAP (red for cytoplasm; shown by the white arrow). M–R, In a double immunofluorescent study of endogenous homing HSCs, many BrdU-immunoreactive cells (green for nuclei) colocalized with the cellular markers of GFAP and MAP-2 (red for cytoplasm; shown by the white arrow). Scale bars, 50 μm. To determine whether PBSCs could induce angiogenesis (through endogenous homing HSCs and exogenous transplanted PBSCs differentiated into vascular–endothelial cells at ischemic sites), double immunofluorescent staining, FITC-dextran perfusion studies, and blood vessel density assays were performed on brain slices from PBSC-treated and vehicle control-treated rats. The results indicated that several exogenous transplanted PBSCs (bisbenzimide-labeled) and endogenous homing HSCs (BrdU-immunoreactive) showed vascular phenotypes (vWF cells) around the perivascular and endothelial regions (Fig. 5A–F) in the penumbric region of ischemic hemispheres of PBSC-treated rats. Visual inspection indicated that treatment with PBSCs (n = 6) significantly enhanced cerebral microvascular perfusion with FITC-dextran in comparison with control rats (n = 6) (p < 0.05) (Fig. 5G,H). Quantitative measurement of blood vessel density examined by immunostaining of CD31 (Fig. 5I,J) showed that ischemic rats treated with PBSCs (n = 4) showed significantly more neovasculature in the penumbric area than control rats (n = 4) (p < 0.05) (data not shown). Intracerebral PBSC treatment enhanced the angiogenesis in the ipsilateral hemisphere. A–F, In double immunofluorescent studies, some bisbenzimide-labeled (exogenous) and BrdU+ cells (endogenous) showing vascular phenotypes (vWF+ cells) (shown by the white arrow) were found around the perivascular and endothelial regions of the ischemic hemispheres of PBSC-treated rats. G, H, To assess penumbric cerebral microvascular perfusion, FITC-dextran was administrated intravenously to evaluate the microvascular pattern of PBSC-treated and control rats. I, J, Calculating the cerebral blood vessel density stained by CD31 immunoreactivity. K, In colocalized immunofluorescent studies, some bisbenzimide-labeled cells showing macrophage/microglial phenotypes (OX-42+/ED-1 cells) (shown by the white arrow) were found around the perivascular (FITC-dextran-perfused vessels) regions of the ischemic hemispheres of PBSC-treated rats. L, Results of Western blotting analysis of expression of β1 integrin with or without adding synthetic cyclic RGD peptide in different treatment groups: PBSCs (S), control (C), and PBSCs adding RGD (S+I). Data are expressed as mean ± SEM. *p < 0.05 versus control. Scale bars, 50 μm. To demonstrate the association between angiogenesis and macrophage cells, double immunofluorescent staining and FITC-dextran perfusion studies of the brain specimens of the PBSC transplantation and control groups were examined. The results indicate that several exogenous transplanted MPBSCs (bisbenzimide-labeled) showed MA/MI phenotypes (OX-42/ED-1 cells) infiltrated around the perivascular regions (FITC-dextran-perfused vessels) (Fig. 5K) of the ischemic hemispheres of PBSC-treated rats. Significantly increased numbers of MA/MI cells could be observed around the vessels in the PBSC-treated rats compared with control-treated rats (p < 0.05) (data not shown). In addition, protein expression of β1 integrin showed a significant increase in the PBSC-treated rats (n = 4) compared with control rats (n = 4) (p < 0.05) (Fig. 5L). However, after adding the synthetic cyclic RGD peptide, the expression of β1 integrin, the neurological behavior measurement (Fig. 6A), and blood vessel density (CD31 immunoreactive cells) (Fig. 6B) showed no significant difference between these three therapeutic groups (n = 4, each group). PBSC-derived angiogenesis could enhance cerebral blood flow in the ischemic hemisphere. A, Data for neurological behavioral measurements in the three treatment groups: S+I, S, and C. B, The results for numbers of blood vessel density in the three treatment groups. C, The results from analysis of rCBF using LDF monitoring with Diamox injection showed a significant increase in rCBF in the MCA cortex of the ischemic brain in the PBSC-treated rats compared with control rats. Data are expressed as mean ± SEM. *p < 0.05 versus control. Scale bar, 50 μm. Increased vessel density would enhance neuronal survival, especially associated with an increased cerebral blood flow, which would result in efficient delivery of oxygen and nutrients. Therefore, to examine rCBF in the ischemic brain, experimental rats were injected with Diamox and monitored by LDF under anesthesia after cerebral ischemia. The results showed a significant increase in rCBF in the middle cerebral artery cortex of the ischemic brain in the PBSC-treated rats (n = 6) compared with control rats (n = 6) (p < 0.05) (Fig. 6C). To study the improvement of neurological function after cerebral ischemia in PBSC-treated rats, we examined the expression of mRNA species coding for trophic factors known to neuroprotect the ischemic cortical area. This was done at four time points (3, 7, 14, and 28 d) after PBSC transplantation. We evaluated neurotrophic factors, including stromal cell-derived factor 1 (SDF-1), BDNF, glial cell line-derived neurotrophic factor (GDNF), NGF, TGF-β, FGF-II, and vascular endothelial growth factor (VEGF) in the PBSC group (n = 5) and the control group (n = 5). In conventional RT-PCR, the results revealed significantly increased expression of SDF-1, VEGF, and BDNF in ischemic rats treated with PBSCs in comparison with the vehicle control group (Fig. 7A). In QRT-PCR analysis, the ratio of expression level of SDF-1, VEGF, and BDNF to GAPDH peaked at about a twofold increase in the PBSC-treated group, in comparison with the vehicle control group (p < 0.05) (Fig. 7B). PBSC transplantation modulates neurotrophic factor expression in ischemic rats. A, Results of conventional RT-PCR analysis. Using gene-specific primers, RT-PCR was performed for SDF-1, VEGF, and BDNF in brain samples from the cortex and striatum of PBSC-treated rats at different time points (3, 7, 14, and 28 d) after the initiation of treatment protocol. GAPDH was used as an internal control. Brain samples of vehicle control rats are indicated by “C.” B, In the results of QRT-PCR analysis, the ratio of expression level of SDF-1, VEGF, and BDNF mRNA was relative to GAPDH mRNA. The mean ± SEM is shown. *p < 0.05 versus control. In this study, rats receiving intracerebral PBSC transplantation showed significantly improved neurological function after chronic cerebral ischemia in comparison with vehicle-treated control rats. 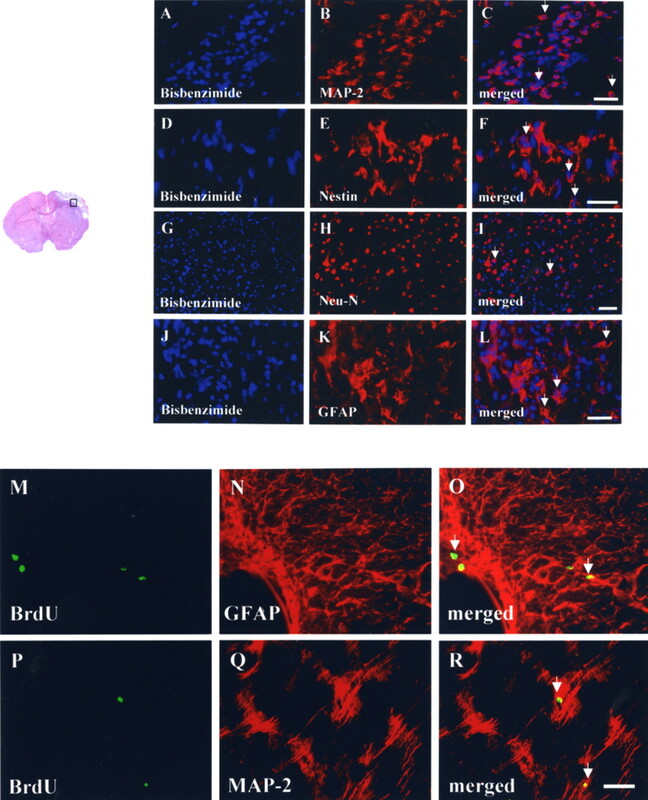 In the PBSC group, exogenous transplanted PBSCs and endogenous homing stem cells were seen to migrate toward the cerebral infarcted zone and differentiate into glial cells (GFAP+), neurons (Nestin+, MAP-2+, and Neu-N+) and vascular endothelial cells (vWF+), thereby enhancing neuroplasticty in the ischemic brain. In addition, cortical neuronal activity as evaluated by 1H-MRS increased considerably in the PBSC transplantation group of rats in comparison with the control group. The PBSC transplantation group promoted the formation of new vessels, to increase the local cortical blood flow in the ischemic hemisphere. Cellular and molecular mechanisms of vascular remodeling in local neovascularization of the ischemic brain have been demonstrated by perivascular infiltration of stem cell-derived macrophage/microglial cells and increased expression of β1 integrin. Finally, the PBSC transplantation group also exhibited a significant increase in modulation of neurotrophic factor expression in the ischemic hemisphere. In our study, transplanted PBSCs and endogenous homing HSCs included major populations of CD34+ cells, which have been proven to enhance neovascularization in the penumbra region of the ischemic brain and subsequently promote prominent neurogenesis (Taguchi et al., 2004). A relationship between angiogenesis and neurogenesis induced by CD34+ cells would be consistent with the regeneration of parenchymal cells after injury seen in other organs (Toda et al., 1999; Ross et al., 2001). Thus, the major mechanism underlying this observation of coexistence of neurogenesis and angiogenesis might include enhanced production of trophic factors such as BDNF (Leventhal et al., 1999; Borlongan et al., 2004) and PDGF (Johe et al., 1996) by CD34+ cell-derived neovasculatures, and directly result in differentiation of these CD34+ stem cells into neuron/glial cells (Hao et al., 2003). Furthermore, CD34+ cell-derived neovasculatures contributing to maintain newly formed neuron/glial cells have been shown to integrate into networks in adult animals (Louissaint et al., 2002), and to provide an environment conducive to neurogenesis (Valable et al., 2003). In conclusion, we believe that the combination of endogenous homing stem cell targeting plus the allograft exogenous PBSC transplantation reported here represents an attractive treatment for cerebrovascular diseases. As demonstrated previously, new blood vessel growth could be exclusively dependent on the growth of endothelial cells (Schaper and Ito, 1996). However, the exact mechanism that leads to angiogenesis or collateral circulation of arteries after stem cell transplantation is not yet known. A recent study indicated that not only endothelial cells but also MA/MI cells may be essential (Heil et al., 2002). In this study, immunofluorescent colocalization analysis in FITC-dextran-perfused blood vessels was used to count the number of recruited MA/MI cells, demonstrating that the activated MA/MI cells are involved in remodeling of new vascular growth. We found that MA/MI cell numbers are significantly increased over the penumbric area in chronic stroke rats treated with the PBSCs compared with control-treated rats. From double immunofluorescent analysis, stem cell-derived MA/MI cells (bisbenzimide-labeled) were seen to adhere to the perivascular region of the ischemic brain in PBSC-treated rats. In addition, increased expression of β1 integrin and improvement in neurological behavior were both blocked by the addition of synthetic RGD peptide (β1 integrin inhibitor). 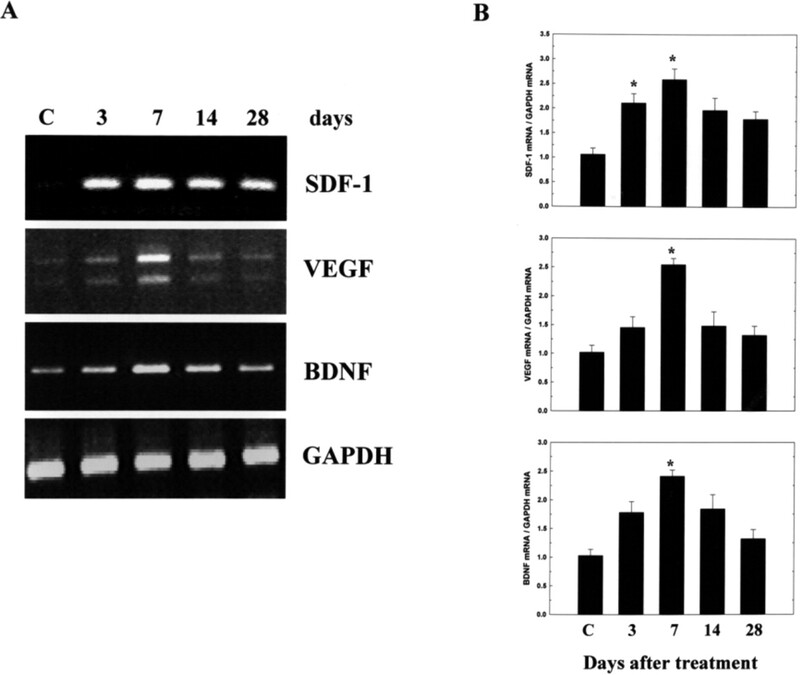 Finally, in this study, angiogenic growth factors such as SDF-1 and VEGF were significantly upregulated in PBSC-treated rats compared with control-treated rats. Therefore, angiogenic growth factor and some adhesion molecules produced by an interaction between implanted stem cells and host brain parenchymal cells might initiate MA/MI adherence to sites of occluded vessels (Buschmann et al., 2003; Pipp et al., 2003; Shastry and Tyagi, 2004; Li et al., 2005; Tucker et al., 2005). Subsequently, MA/MI began to release some proteinases to guide vascular remodeling in the ischemic brain (Fujiyama et al., 2003; Milner and Campbell, 2003; Pipp et al., 2003). In the PBSC-treated group, profound angiogenesis would have to occur to recover the cerebral blood flow over the ischemic brain. It might be the case that enhanced neuroplastic effect via functional angiogenesis (Taguchi et al., 2004) provides better neurological outcomes. A recent report indicated that SDF-1/CXC chemokine receptor 4 (CXCR4) is a strong chemoattractant for CD34+ cells and also plays an important role in HSC trafficking between peripheral circulation and bone marrow (Petit et al., 2002). Recently, another study demonstrated that focal cerebral ischemia causes an increase in SDF-1/CXCR4 expression in regions adjacent to the infarcted area (Hill et al., 2004). This lesion-induced upregulation of endothelial SDF-1 (Stumm et al., 2002) as well as the appearance of increased CXCR4 expression in the ischemic hemisphere 4 h after ischemia, as explained in our recent report (Shyu et al., 2004b), together indicate that cerebroendothelial SDF-1 could be a chemoattractant for peripheral blood cells. However, upregulation of SDF-1 in the penumbric area has been shown to diminish significantly 7 d after the induction of cerebral ischemia (Hill et al., 2004). In our “chronic” stroke model, the expression of SDF-1 may have decreased progressively in comparison with the “acute” ischemic brain. 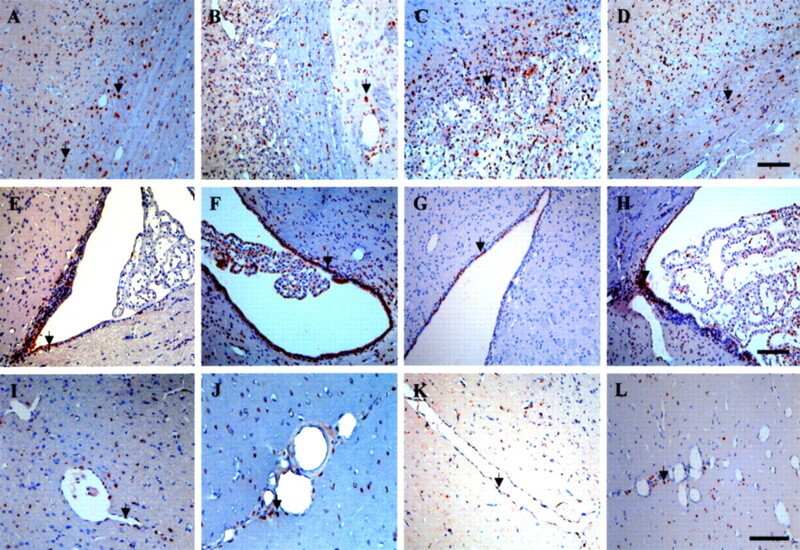 However, in this study, interaction of transplanted PBSCs with injured brain tissue may lead PBSCs and/or parenchymal cells to produce trophic factors (Lachmund et al., 1994) including SDF-1 that may contribute to the recovery of neural functions lost as a result of tissue injury (Williams et al., 1986). Therefore, it could be that decreased expression of SDF-1 1 week after cerebral ischemia is compensated by the transplanted PBSCs and may cause enough stem cells to home into the ischemic brain; this may lead to the recovery of postischemic neurological performance after PBSC treatment seen in this study. In this study, we have developed a novel therapeutic strategy to treat chronic stroke rats using intracerebral PBSC transplantation. Neurological dysfunction after chronic stroke showed significant improvement in a PBSC-treated rat population compared with vehicle control-treated rats. Exogenous PBSC transplantation was found to increase the number of endogenously central and peripheral stem cells homing to the lesioned brain, resulting in a significant improvement in neurological function after chronic stroke. Furthermore, exogenous PBSCs transplanted into the ischemic hemisphere resulted in significant increases in neurotrophic factors including SDF-1 and BDNF in PBSC-treated rats compared with control-treated rats. Therefore, we could speculate that these trophic factors not only increased the survival rates of the ischemic neurons in the penumbra region, but also induced endogenous HSCs to migrate and home into the ischemic brain to repair it. In addition, one of these factors, SDF-1, might be the key substance that induced endogenous stem cell targeting to the ischemic hemisphere. Recently, it was demonstrated that focal cerebral ischemia causes an increase in SDF-1 expression in regions adjacent to the infarcted area (Stumm et al., 2002). SDF-1 is a CXC chemokine constitutively produced by bone marrow stromal cells and is a potent chemoattractant for stem cells. By attracting endogenous stem cells to the ischemic region, an SDF-1/CXCR4 interaction may be directly involved in vascular remodeling, angiogenesis (De Falco et al., 2004), and neurogenesis (Stumm et al., 2002), thereby alleviating stroke symptoms. As a consequence of this autocrine regulatory pathway, endothelial and neuronal progenitor cells may mobilize and fuse with each other, a step required for subsequent formation of a structured network of branching vessels and neurons (Chen et al., 2003). This work was supported in part by research grants from the Chen-Han Foundation for Education, Academia Sinica (AS92IMB3), and the National Science Council (NSC93-2314-B-303-009). We thank Dr. K. Deen for his critical reading of this manuscript. ↵*W.-C.S. and S.-Z.L. contributed equally to this work. Asahara T, Murohara T, Sullivan A, Silver M, van der Zee R, Li T, Witzenbichler B, Schatteman G, Isner JM (1997) Isolation of putative progenitor endothelial cells for angiogenesis. Science 275:964–967. Barinaga M (2000) Fetal neuron grafts pave the way for stem cell therapies. Science 287:1421–1422. Boer GJ (1994) Ethical guidelines for the use of human embryonic or fetal tissue for experimental and clinical neurotransplantation and research. Network of European CNS Transplantation and Restoration (NECTAR). J Neurol 242:1–13. Borlongan CV, Saporta S, Poulos SG, Othberg A, Sanberg PR (1998) Viability and survival of hNT neurons determine degree of functional recovery in grafted ischemic rats. NeuroReport 9:2837–2842. Borlongan CV, Hadman M, Sanberg CD, Sanberg PR (2004) Central nervous system entry of peripherally injected umbilical cord blood cells is not required for neuroprotection in stroke. Stroke 35:2385–2389. Buschmann IR, Busch HJ, Mies G, Hossmann KA (2003) Therapeutic induction of arteriogenesis in hypoperfused rat brain via granulocyte-macrophage colony-stimulating factor. Circulation 108:610–615. Chang CF, Lin SZ, Chiang YH, Morales M, Chou J, Lein P, Chen HL, Hoffer BJ, Wang Y (2003) Intravenous administration of bone morphogenetic protein-7 after ischemia improves motor function in stroke rats. Stroke 34:558–564. Chen J, Zhang ZG, Li Y, Wang L, Xu YX, Gautam SC, Lu M, Zhu Z, Chopp M (2003) Intravenous administration of human bone marrow stromal cells induces angiogenesis in the ischemic boundary zone after stroke in rats. Circ Res 92:692–699. Chen ST, Hsu CY, Hogan EL, Maricq H, Balentine JD (1986) A model of focal ischemic stroke in the rat: reproducible extensive cortical infarction. Stroke 17:738–743. De Falco E, Porcelli D, Torella AR, Straino S, Iachininoto MG, Orlandi A, Truffa S, Biglioli P, Napolitano M, Capogrossi MC, Pesce M (2004) SDF-1 involvement in endothelial phenotype and ischemia-induced recruitment of bone marrow progenitor cells. Blood 104:3472–3482. Demetri GD, Griffin JD (1991) Granulocyte colony-stimulating factor and its receptor. Blood 78:2791–2808. Dennis JE, Charbord P (2002) Origin and differentiation of human and murine stroma. Stem Cells 20:205–214. Dunnett SB, Torres EM, Annett LE (1998) A lateralised grip strength test to evaluate unilateral nigrostriatal lesions in rats. Neurosci Lett 246:1–4. Elfenbein GJ, Sackstein R (2004) Primed marrow for autologous and allogeneic transplantation: a review comparing primed marrow to mobilized blood and steady-state marrow. Exp Hematol 32:327–339. Erices A, Conget P, Minguell JJ (2000) Mesenchymal progenitor cells in human umbilical cord blood. Br J Haematol 109:235–242. Fujiyama S, Amano K, Uehira K, Yoshida M, Nishiwaki Y, Nozawa Y, Jin D, Takai S, Miyazaki M, Egashira K, Imada T, Iwasaka T, Matsubara H (2003) Bone marrow monocyte lineage cells adhere on injured endothelium in a monocyte chemoattractant protein-1-dependent manner and accelerate reendothelialization as endothelial progenitor cells. Circ Res 93:980–989. Galvin-Parton PA (2003) Screening for GALC to make neonatal diagnosis and initial neonatal stem cell treatment with umbilical cord blood. Pediatr Transplant 7:83–85. Ha Y, Choi JU, Yoon DH, Yeon DS, Lee JJ, Kim HO, Cho YE (2001) Neural phenotype expression of cultured human cord blood cells in vitro. NeuroReport 12:3523–3527. Hao HN, Zhao J, Thomas RL, Parker GC, Lyman WD (2003) Fetal human hematopoietic stem cells can differentiate sequentially into neural stem cells and then astrocytes in vitro. J Hematother Stem Cell Res 12:23–32. Heil M, Ziegelhoeffer T, Pipp F, Kostin S, Martin S, Clauss M, Schaper W (2002) Blood monocyte concentration is critical for enhancement of collateral artery growth. Am J Physiol 283:H2411–H2419. Hill WD, Hess DC, Martin-Studdard A, Carothers JJ, Zheng J, Hale D, Maeda M, Fagan SC, Carroll JE, Conway SJ (2004) SDF-1 (CXCL12) is upregulated in the ischemic penumbra following stroke: association with bone marrow cell homing to injury. J Neuropathol Exp Neurol 63:84–96. Johe KK, Hazel TG, Muller T, Dugich-Djordjevic MM, McKay RD (1996) Single factors direct the differentiation of stem cells from the fetal and adult central nervous system. Genes Dev 10:3129–3140. Kreis R, Ross BD, Farrow NA, Ackerman Z (1992) Metabolic disorders of the brain in chronic hepatic encephalopathy detected with H-1 MR spectroscopy. Radiology 182:19–27. Lachmund A, Gehrke D, Krieglstein K, Unsicker K (1994) Trophic factors from chromaffin granules promote survival of peripheral and central nervous system neurons. Neuroscience 62:361–370. Leventhal C, Rafii S, Rafii D, Shahar A, Goldman SA (1999) Endothelial trophic support of neuronal production and recruitment from the adult mammalian subependyma. Mol Cell Neurosci 13:450–464. Li TS, Ito H, Hayashi M, Furutani A, Matsuzaki M, Hamano K (2005) Cellular expression of integrin-beta 1 is of critical importance for inducing therapeutic angiogenesis by cell implantation. Cardiovasc Res 65:64–72. Lindvall O, Kokaia Z, Martinez-Serrano A (2004) Stem cell therapy for human neurodegenerative disorders—how to make it work. Nat Med [Suppl] 10:S42–S50. Louissaint A Jr, Rao S, Leventhal C, Goldman SA (2002) Coordinated interaction of neurogenesis and angiogenesis in the adult songbird brain. Neuron 34:945–960. Lu D, Margouleff C, Rubin E, Labar D, Schaul N, Ishikawa T, Kazumata K, Antonini A, Dhawan V, Hyman RA, Eidelberg D (1997) Temporal lobe epilepsy: correlation of proton magnetic resonance spectroscopy and 18F-fluorodeoxyglucose positron emission tomography. Magn Reson Med 37:18–23. Luo F, Liu X, Li S, Liu C, Wang Z (2004) Melatonin promoted chemotaxins expression in lung epithelial cell stimulated with TNF-alpha. Respir Res 5:20. Milner R, Campbell IL (2003) The extracellular matrix and cytokines regulate microglial integrin expression and activation. J Immunol 170:3850–3858. Morris DC, Zhang Z, Davies K, Fenstermacher J, Chopp M (1999) High resolution quantitation of microvascular plasma perfusion in non-ischemic and ischemic rat brain by laser-scanning confocal microscopy. Brain Res Brain Res Protoc 4:185–191. Nakahata T, Ogawa M (1982) Hemopoietic colony-forming cells in umbilical cord blood with extensive capability to generate mono- and multipotential hemopoietic progenitors. J Clin Invest 70:1324–1328. Orlic D, Kajstura J, Chimenti S, Limana F, Jakoniuk I, Quaini F, Nadal-Ginard B, Bodine DM, Leri A, Anversa P (2001) Mobilized bone marrow cells repair the infarcted heart, improving function and survival. Proc Natl Acad Sci USA 98:10344–10349. Petit I, Szyper-Kravitz M, Nagler A, Lahav M, Peled A, Habler L, Ponomaryov T, Taichman RS, Arenzana-Seisdedos F, Fujii N, Sandbank J, Zipori D, Lapidot T (2002) G-CSF induces stem cell mobilization by decreasing bone marrow SDF-1 and up-regulating CXCR4. Nat Immunol 3:687–694. Pipp F, Heil M, Issbrucker K, Ziegelhoeffer T, Martin S, van den Heuvel J, Weich H, Fernandez B, Golomb G, Carmeliet P, Schaper W, Clauss M (2003) VEGFR-1-selective VEGF homologue PlGF is arteriogenic: evidence for a monocyte-mediated mechanism. Circ Res 92:378–385. Prockop DJ (1997) Marrow stromal cells as stem cells for nonhematopoietic tissues. Science 276:71–74. Ross MA, Sander CM, Kleeb TB, Watkins SC, Stolz DB (2001) Spatiotemporal expression of angiogenesis growth factor receptors during the revascularization of regenerating rat liver. Hepatology 34:1135–1148. Schaper W, Ito WD (1996) Molecular mechanisms of coronary collateral vessel growth. Circ Res 79:911–919. Shastry S, Tyagi SC (2004) Homocysteine induces metalloproteinase and shedding of beta-1 integrin in microvessel endothelial cells. J Cell Biochem 93:207–213. Shyu WC, Lin SZ, Saeki K, Kubosaki A, Matsumoto Y, Onodera T, Chiang MF, Thajeb P, Li H (2004a) Hyperbaric oxygen enhances the expression of prion protein and heat shock protein 70 in a mouse neuroblastoma cell line. Cell Mol Neurobiol 24:257–268. Shyu WC, Lin SZ, Yang HI, Tzeng YS, Pang CY, Yen PS, Li H (2004b) Functional recovery of stroke rats induced by granulocyte colony-stimulating factor-stimulated stem cells. Circulation 110:1847–1854. Sigurjonsson OE, Perreault MC, Egeland T, Glover JC (2005) Adult human hematopoietic stem cells produce neurons efficiently in the regenerating chicken embryo spinal cord. Proc Natl Acad Sci USA 102:5227–5232. Stumm RK, Rummel J, Junker V, Culmsee C, Pfeiffer M, Krieglstein J, Hollt V, Schulz S (2002) A dual role for the SDF-1/CXCR4 chemokine receptor system in adult brain: isoform-selective regulation of SDF-1 expression modulates CXCR4-dependent neuronal plasticity and cerebral leukocyte recruitment after focal ischemia. J Neurosci 22:5865–5878. Taguchi A, Soma T, Tanaka H, Kanda T, Nishimura H, Yoshikawa H, Tsukamoto Y, Iso H, Fujimori Y, Stern DM, Naritomi H, Matsuyama T (2004) Administration of CD34+ cells after stroke enhances neurogenesis via angiogenesis in a mouse model. J Clin Invest 114:330–338. To LB, Roberts MM, Haylock DN, Dyson PG, Branford AL, Thorp D, Ho JQ, Dart GW, Horvath N, Davy ML, Olweny CL, Abdi E, Juttner CA (1992) Comparison of haematological recovery times and supportive care requirements of autologous recovery phase peripheral blood stem cell transplants, autologous bone marrow transplants and allogeneic bone marrow transplants. Bone Marrow Transplant 9:277–284. Toda S, Nishimura T, Yamada S, Koike N, Yonemitsu N, Watanabe K, Matsumura S, Gartner R, Sugihara H (1999) Immunohistochemical expression of growth factors in subacute thyroiditis and their effects on thyroid folliculogenesis and angiogenesis in collagen gel matrix culture. J Pathol 188:415–422. Tucker BA, Rahimtula M, Mearow KM (2005) Integrin activation and neurotrophin signaling cooperate to enhance neurite outgrowth in sensory neurons. J Comp Neurol 486:267–280. Tuettenberg J, Heimann A, Kempski O (2001) Nitric oxide modulates cerebral blood flow stimulation by acetazolamide in the rat cortex: a laser Doppler scanning study. Neurosci Lett 315:65–68. Valable S, Bellail A, Lesne S, Liot G, Mackenzie ET, Vivien D, Bernaudin M, Petit E (2003) Angiopoietin-1-induced PI3-kinase activation prevents neuronal apoptosis. FASEB J 17:443–445. Williams LR, Varon S, Peterson GM, Wictorin K, Fischer W, Bjorklund A, Gage FH (1986) Continuous infusion of nerve growth factor prevents basal forebrain neuronal death after fimbria fornix transection. Proc Natl Acad Sci USA 83:9231–9235. Zhang RL, Zhang ZG, Zhang L, Chopp M (2001) Proliferation and differentiation of progenitor cells in the cortex and the subventricular zone in the adult rat after focal cerebral ischemia. Neuroscience 105:33–41.